Comments - Charming image of a beauty stretched out on a bed fast asleep. A green kimono patterned with irises is draped over her hips, and her pillow lies overturned nearby. 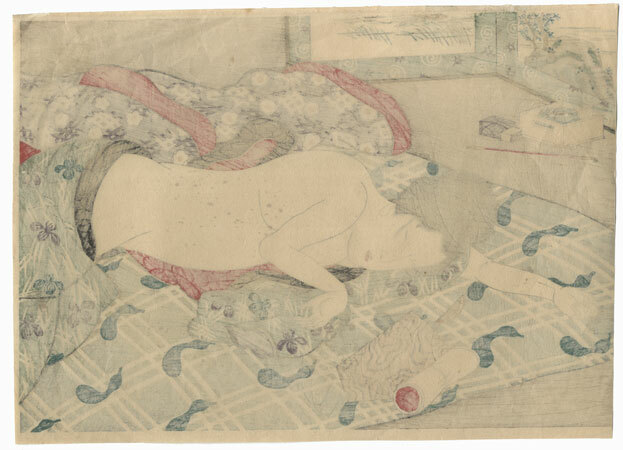 Another kimono is spread out alongside the woman, the small white flowers on it delicately embossed. A tobacco set and pipe rest next to a folding screen with a landscape design. An attractive subject, seldom seen in reprint.